What about the materials? This guys painted the buildings like Romans or Mesoamericans? That's the palace at Dungur, in modern day Ethiopia (Fig. 73 and 74). Built by the Axumites in the 4th-6th century. There were several similar palaces in that area, but the model shows one of the biggest ones. In the 1930's, the occupying Italian army purposefully built a road straight through the ruins of the biggest one, as part of their revenge for the battle of Adwa in 1892. With the scale is the only thing I see isn't the best. The problem the acces to this information is restricted. @feneur help us providing acces or give more help to this. That was just an old 3ds Max file with some objects already in it, so I don't really think it's useful any more. Maybe someone can create a new one, but otherwise just import some existing models to compare with. I would think that one of the new unit model source files would be a good one, and perhaps include an existing building to get an idea of what kind of dimensions it should have etc. So there aren't schetches of proportions or some information for Juli? Only old technical 3D stuff. @Sundiata Yes, I was hoping you will say that. I would like to develop the Kushite mod together with you. There are many steps in the development which does not require programming skills, but at some point in time you need to do some programming. I am a software engineer (programmer) and more then willing to take on the development, especially on the technical side. Other 0 A.D. community members will help us during the development. However, many active members of this forum are already involved in other projects and cannot take the responsibility of another project. The open source model allows other people to join in. We actually need to involve artists in the development process. However, they should be able to pick a task like modeling a unit or house and than work again on other projects. To make that possible, we should be the one who have an overview and take decisions. This includes to update the task list, review contributions and answer questions related to the Kushite mod. Such a development style is called Bazzar model (see https://en.wikipedia.org/wiki/The_Cathedral_and_the_Bazaar#.22The_Cathedral_and_the_Bazaar.22). @Lion.Kanzen and @Juli51. I know that you are capable of communicating in English. The question why I asked, especially @Lion.Kanzen, because you are able to speak Spanish too. The Digital Divide is not only a question of having Internet Access, but also the question of having resources available in your language. Most of the resources on the internet including the description of 0 A.D. and mods are in English. A description in a single language excludes everybody who speaks only one language. As far as the Kushite mod goes. It would be nice to have the mod description and download instructions available in English, French and Spanish to make the mod available to a larger audience. I mean it would be amazing if a child starts playing 0 A.D. and then plays the Kushite mod, because the download description was translated in his own language (not English) and after some time starts contributing missing assets and other stuff to 0 A.D and/or is inspired to start another mod. @Enrique and @LordGood how could we create a good color palette and a texture pack? Which one of both should come first. Could you provide a short description of your common artistic workflow and highlight the steps which make use of either one of them or both? I was always assuming that you create the model first (polygon) and then select/create the texture for the model. Why is creating a texture pack at the beginning better? It's not a matter of creating the texture and forget about it to dedicate entirelly to modelling. It's a process of iterating over the texture as you go along all buildings. Defining the color tones of the texture at te beginning would prevent to rework the texture several times. Nobody has to follow the same workflow, just see what you see fit for your way of working. Can be nice see where mostly RTS like AoE, in Argentina and Spain are sacred as the CS Go. my country(region) appears in Aoe 2 and 3 mentioned and as map. Can be nice Niektb guide, they are like our greatest lead in Council of Modders. We copy the form to make mode by Scion Studios ( original owner from Rise to the east) , and they based their method in main developing, that start with a design document. Ask Zophim he is expert doing this. I am a software engineer (programmer) and more then willing to take on the development, especially on the technical side. I guess we will be spending the next few weeks answering some more open questions, as you put it earlier, gathering and organizing information and references, and creating the relevant topics in the correct places in the forum, as well as creating a comprehensive design document. I guess creating a repository in github.com/0ADMods is one of the first things? Do we need permission to start this? As well as creating a new entry in the Mods section, that will house all future discussions and topics on The Kingdom of Kush. Again, do we need permission from an administrator or something? @Enrique Thank you again for your reply, I hope all these questions aren't too bothersome. I have a few more questions about textures and color palettes. What is the benefit of "inventing" a color palette, as opposed to using the colors we know they used? Are there any downsides to remaining as historically accurate with regards to this color palette? Secondly, about textures, I understand there are some licensing issues we need to be aware of. What are your preferred sources for textures? Do you contact photographers to ask permission to use their pictures (of plain brick wall for example)? Do you use your own pics? And is there an outline available with all the specific requirements for a texture pack (file types, sizes, examples)? I feel I should do a bit of explanation on the organizational side to lift some of the confusion around here. The 0ADMods organization on Github is one and the same as the Council of Modders in this forum. The Council of Modders is a semi-open (there are some group PMs) group dedicated to (guess what) modding and it was formed by joining Rise of the East, Millennium A.D. and Aristeia together. It's a fairly loose and semi-unorganized team (hence 'Council') and it's moderated by the initial members (I happen to be one of them). The mod pages on ModDB are also managed by us. @Sundiata You're not "inventing" the color palette, you design it based on the facts that you know from the materials and paint used by the civ. If you know the colors they used, then you know where to aim while creating the color palette. It's to make the civ structures look good. If you want examples of textures, you can check the ones already in the game. For textures, you can look for CC0 textures and/or CC-BY-SA 3.0 or higher. Also there's www.texturemate.com and http://3dwolf.weebly.com/textures.html etc... There's plenty of sites offering completely free textures with CC0 license, you just have to look for them. Normally there are two 1024x1024 textures for each civ structure set. You can merge them in one big 2048x1024 texture for easier setup. Use alpha transparency where you want playercolor to show up. There are a few tutorials in the art forum about art stuff. Also you can check http://trac.wildfiregames.com/ the "for artists" section for more information about 0AD artist guidelines, tutorial links etc. And I fully understand your concern about this mod possibly never even reaching a release. I've been "lurking" on and off on this forum for a few years now, and I've seen many suggestions and Idea's, but only a fraction of them ever materialize. So as I mentioned on the first page, I don't want anyone to think I'm jumping the gun here. I realize there is a TON of work ahead. But as I also said earlier, if there's is any chance of a Kushite mod seeing the light of day, I want to do what I can. You guys have been quite accommodating for something that essentially came out of nowhere, so thank you for the patience and interest. I hope I can count on some of you to continue to help me with some of my noob questions… You've been most helpful up to now! I sincerely hope, that together with balduin and others interested, we'll be able to present some progress in due time, even if it is originally restricted to concept art, and a clear civilization profile/design document and repository. @EnriqueMagnificent, thank you. I've never made a texture pack before, but I'll be spending some time learning this. I have a degree in graphic art, but it's nowhere near the level some of you guys are at. I do believe I can create a decent texture pack though (photoshop is an acceptable tool to make texture packs, I presume?). @Sundiata Indeed Photoshop is highly acceptable. You can also use GImp, Krita, Paint.net or whatever you want that allows to release files under CC-BY-SA 3.0. If you want to keep the same license that is. @niektb Thanks for the explanation. creating a new entry in the Mods section, that will house all future discussions and topics on The Kingdom of Kush. Again, do we need permission from an administrator or something? Can anybody from the community answer the question about creating a subforum in the Mod forum? Asking to @feneur , because he have administration rights over all forums. I willsay as I usually do that if there is a need for and benefit from adding a new forum I will gladly do it. But at the moment I don't think there is a need for one. Soon maybe, depending on how much progress is made, but not yet. That isn't sarcastic I hope? Hahaha, euhm, but at least ROTE is almost there, no? Anyway, what I meant to say is, that these other projects have been in the pipeline for years, so it's normal they get the prerogative. We will just have to do our best to attract new artists willing to work on the project. Or become accomplished artists ourselves I'm sure after a few blender tutorials I'll be modeling entire civilizations with ease…. [read heavy sarcasm]… I saw some blender videos of lordgood on youtube yesterday, and I was quite impressed! The weapons in fig. 25a & 25b, are indeed some kind of unique combination of billhook and axe on a long shaft. Besides the very interesting and unique weapon, did you recognize the dog in 25b, which kills somebody by baiting them in the face. Kind of brutal. However, did the Kushites use war dogs or is this just the prince and his haunting dog? Very good observation! And a good question too. I couldn't find specific info on the use of war dogs in Kush yet, but from petroglyphs, we know hunting dogs were used in Sudan since the earliest periods. We also know that war dogs were used against them in the New Kingdom by the pharaohs, so they were familiar with the concept. The plaque of the crown prince Arikhankharer with his war dog (fig. 25b) dates to about 15AD, which is post-Roman contact. Romans also used war dogs, and might have reintroduced the concept (if it had been forgotten). For now, there isn't much to go on to add it as a unit on its own, but I do think having Arikhankharer as a hero, with the ability to recruit 1 to 5 dogs which automatically guard him (like in AOEIII) would be an interesting idea. Because of the dogs, any unit within his area of influence would get a defense bonus. Fig. 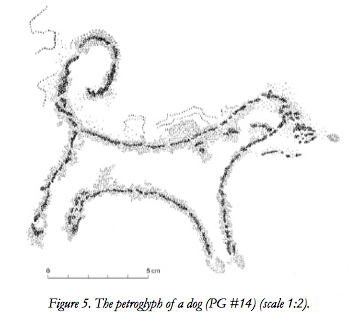 79 A dog from a petroglyph at the fortress of Gala Abu Ahmed, Napatan period (military context??). In anticipation of further research and development on a Kushite mod, I decided to share some more needed illustrations of historically accurate Kushite units. First, I will discuss a number of other images relevant to solving some open questions and providing a better visualization of Kush. Landscape: Although essentially a Nile Valley Civilization, the Kushites were not as dependent on the NIle as their northern neighbor. Many important Kushite sites are far away from the Nile, sometimes more than a 100 km away. This is largely due to the fact that the Butana steppe, the Meroitic heartland, is a seasonal savannah, as are many areas more to the south. For about 3 months in the year, the desert turns green! In Meroitic times, rainfall was markedly higher, and areas far from the Nile supported small acacia forests and large grasslands, which in turn could support larger populations than they can today. Fig. 80 Greenery at Al Azrak, in the border region between Sudan and South Sudan. This biotope reflects what the Kushite heartland would have looked like for several months in the year. Fig. 81 Archaeological plan of the excavated sites in ancient Naqa. Naqa was an important Meroitic site, 50km east of the Nile, with temples, palaces and large cemeteries. The central (royal) settlement area is about 600m x 400m, and has large walled sections. Residential areas of a less permanent nature would have surrounded the central site. Fig. 82 Just to offer some perspective. The two most famous, and well preserved (restored) structures in Naqa, the Lion temple and the "Roman Kiosk" (actually a shrine to Hathor), are actually the two smallest structures on the entire site! Fig. 83 This excerpt from "The capital of Kush" describes a furnace for iron-smelting. It was dome shaped, and located within a building, like all the furnaces in Meroe. Maybe the blacksmith for the Kushites could be a simple rectangular building in a courtyard with a small secondary building with a chimney and an orange glow coming from the doorway, to represent this smelting process. Fig. 84 It remains challenging to locate period depictions of boats in Meroitic Kush, but a pre-dynastic incense-burner from Qustul in Norther Sudan, strengthens my earlier propositions that "Egyptian style boats" are actually a Neolithic development from the border regions between Egypt and Sudan, and were present in Kush long before the Egyptian occupations in Middle- and New Kingdom times. There is no reason these typical high prow "Nile valley boats" can't serve as models for Kushite vessels. Fig. 87 Meroitic bronze sceptre-head, in the form of a bust, probably representing the Qore (Kandake, female ruler) Amanakhareqerem, builder of the Amun temple at El-Hassa. This image is interesting because it features very clear Sub Saharan African stylistic features, but it also features Egyptian symbology. 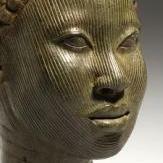 She is seen wearing the cobra shaped Uraeus crown, a symbol of sovereignty, royalty and divine authority. Fig. 89 The relationship with Rome was just as complicated. After a 5 year war with them, in the 20's BC, new trade relations lead to one of Kush's most prosperous periods. This [very rare] drawing of a lost, original fresco, apparently shows a Roman prisoner of war, at the feet of a Meroitic ruler, in the temple to victory, were Emperor Augustus' bronze head was also found. The original caption reads "Detail of a fresco, now lost, apparently showing a Roman soldier as a captured enemy beneath the feet of the Meroitic ruler. From Meroe, late first century BC. Watercolor rendering by H. Schliephack, Garstang Papers, Merseyside Museum, Liverpool." Europeans were called Tmey, by the Kushites. Fig. 90 More foreign prisoners at the feet of Queen Amanitore, on the Lion temple in Naqa. What is interesting is that all three prisoners are wearing a rimmed helmet with chinstrap. Fig. 91 Relief of Meroitic horsemen from temple 250 in Meroe (also know as the "sun temple"). They all carry lances and wear capes. All the horses have decorative bands running across their chest. Fig. 92 Post Meroitic saddle, 375AD, from the cemetery at Qustul. This saddle might not be from the Meroitic period, but it belongs to a Nobatian grave, a people who inherited much of their material culture from the Kushites, and I suspect this includes horsemanship and equipment. The design is distinctly non-Roman, but it is too intricate to have been indigenously developed over the span of a single generation by the Noba. 30 years between the collapse of Meroe, and the burial of this saddle, suggests that this was originally a Meroitic type saddle. Fig. 93 The horses from Ballana, a pre-Christian era Nobatian cemetery, in the Nubian museum in Aswan. The horse trapping (decorative bands of silver discs) seem to be what the earlier Meroitic reliefs are depicting. This is a very good model for Kushite horses. Fig. 94 The Kandake, Queen Amanirenas was the ruling queen during the war with Rome. She was a warrior queen. Strabo called her "Queen Candace", and described her as "a masculine sort of woman, blind in one eye". The image on the left shows an artists' interpretation of what Amanirenas, resting her hand on the Meroe head, looked like, and is based entirely on a relief of the Kandake Amanitore (her successor) on the lion temple in Naqa. Amanirenas is an ideal candidate for a Kushite Hero (perhaps having a bonus-aura against Romans, or heavily armed troops). Her successor, Amanitore was the ruler of Kush during and after the life Jezus of Nazareth, and is probably the "Candace, Queen of the Ethiopians", referred to in the New Testament story of Philip and the Eunich. She was a great builder queen, building a number of temples, and rebuilding temples in Napata after the Roman sack of the city. She could be another hero, with a building bonus (buildings get built faster in her presence). Fig. 95 The image on the left shows the New Testament scene of Philip baptizing the "Ethiopian" treasurer. He is shown with his "Egyptian" chariot and driver. New Kingdom chariots (right) should be the model for Kushite chariots (Kush actually exported chariots to Egypt). Fig. 96 Both these figures show Nubian Axe-men (as mercenaries?) in Egypt. The one on the left is a mounted unit from the Ptolemaic era, and the right one dates to the Roman period. They carry a double headed axe, and the Ptolemaic one is wearing Hellenistic equipment. They are both a good inspiration for (Hellenized) Nubian axe-men. Fig. 97 This is a New Kingdom unit, of Egypt. The reason I include it, is because it would make a perfect champion unit, trained from the Kushite special building, the temple to Amun. The temples to Amun were the foremost bastions of Ancient Egyptian culture in Kush, and continued many Egyptian ideals (including aesthetics in art, architecture, clothing...). The temple complexes to Amun were large, rich, powerful, and heavily guarded. 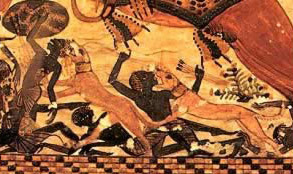 In Thebes, Nubians were traditionally employed to guard the cult of Amun and other temples and shrines. The unit pictured here, seems to be of Nubian origin, and the leopard skin associates him with Amun. Leopard skins were the symbol of choice, for devotees to Amun. This unit could be a close quarter combat, shock infantry unit, called "The warriors of Amun" (or the holy warriors of Amun). Fig. 98 Similarly, the common temple (to Apedemak), could recruit an elite militia unit, called "the warriors of Apedemak" (or the holy warriors of Apedemak), pictured below. They could use pikes in formation, to reflect Hellenistic influence, wear the finest scale armors (in emulation of Apedemak, often shown in scale armor) and to finish it off, they could wear lions-heads. Fig. 99 Beja swordsman and spearman sparring. Beja swordsmen form ideal mercenary units. Fig. 100 Beja camel-warriors, equipped with typical round shield and lance. Fig. 101 A perfect model of a Meroitic gentleman, ready to be armed with a variety of possible weapons. Linen or cotton cloth, wrapped around the torso provide lightweight protection from slashing weapons, and blunting other weapons. I currently don't have the energy to discuss every unit individually, but they all seem to do quite a good job at respecting historical accuracy. They make use of spears and pikes, swords, bows and arrows and axes. layered strips of cotton, wadded/quilted cotton, leather and scale armors, and wicker and hide shields are all used. Questions and remarks always welcome. Thank you for reading!